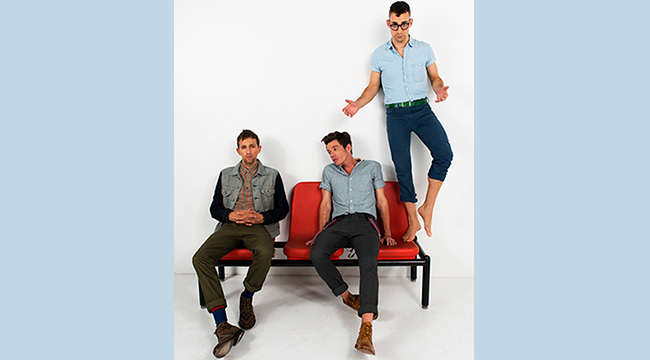 In the course of the five years since it formed, the pop-rock band fun. has quickly gone from indie rock hero to mainstream sensation. “We Are Young,” the single from 2012’s Some Nights can regularly be heard in TV commercials and during sporting event broadcasts. Bassist Andrew Dost recently spoke to us via phone from rehearsals in Rockford, Illinois where the band was getting all its “songs and covers and b-sides and lighting” in order for the tour. “This is the biggest tour so far and it’s the U.S. so we want to make these shows as special as possible,” he said. Here’s the rest of our conversation. I’ve read a bit about the band’s formation, but talk about how you decided to form fun.? You knew Nate Ruess from touring together, right? Nate and Jack toured together and developed a friendship and mutual admiration for each other. My band toured with Nate’s band and I did some horn arrangements for him. We just hit it off. I had met [guitarist] Jack [Antonoff] a few times, but I didn’t know him that well. When Nate called, he told me he wanted us to join him in a band. I figured if Jack is good enough for him, he’s good enough for me. We’ve become great friends. What was it like making your first album, Aim and Ignite? It was a little bit of a challenge. Any time you start a band with new people, you have to develop a language. You have to have certain jobs delegated. We were still finding our way through all that stuff. I know Jack is a good guitar player and I know Nate is a good singer. The first album was a lot of that. We got to work with Steve MacDonald, who is a great friend and wonderful musician. It was fun. It was an exciting time in my life for sure. Right from the opening tune, “Be Calm,” which has some elements of Queen, it’s apparent fun. is more theatrical than The Format. Talk about that side of the band a bit. At the time, we were really into musical theater and the highs and lows that musicals have. We wanted to have that drama. We wanted those tempo shifts. A lot of “Be Calm” was setting the statement for the entire record. We wanted some punishing guitars and drums. We wanted to have some softer stuff. We wanted crazy orchestration. We wanted it to be a mission statement for the entire band. That’s my favorite song on the album because we just went for it. Whether or not we succeeded isn’t as important. We wanted it to be a mission statement for the entire band. That’s my favorite song on the album because we just went for it. Whether or not we succeeded isn’t as important. You toured your asses off after that album came out. What was that like? We did. Since the band started, we have been on the road consistently. It’s grueling for sure and I’m fighting a cold because we just got off three weeks in Europe and there’s been no time to rest. There’s nothing better than getting to see the world and play music with your best friends. I can’t stop doing it, at least until I turn 35. At the moment, we’re loving the ride. When you first set out to record Some Nights, did you have a game plan? Yes and no. We knew that we had our language established. We knew we didn’t have as much to prove to each other. On “Be Calm,” we wanted to show each other what we could do. On Some Nights, we wanted to let the songs breathe a bit more. They were more universal and had more of a groove. Minimalist isn’t the right word because there’s still lot of stuff going on, but we didn’t want to overcomplicate things. That was our goal. The title track has some classic rock elements. What inspired that song? It’s hard to say because I heard somebody mash it up with “Cecelia.” The mashup worked, but I would have never guessed that. We wanted it to be a driving percussive anthem that still had a hummable melody. When we were mixing it, we talked about the vocal sound of Freddie Mercury on “We Will Rock You.” We pushed it in our own direction but vocally, we wanted that gritty sound. You can hear a lot of Queen in our music. It’s not something we consciously do. We know we sound like Queen. I hope that people say that in a good way. “We Are Young” has become the hit of the century. Did you know it when you recorded it? No. We’re not good judges of what makes a song a hit. That was one of the songs the label heard and they knew. We thought, “Okay. We like it as much as the rest of the songs.” We didn’t’ think it was any bigger or better than anything else on the album. We shouldn’t be the ones picking our singles because we would have picked something else. We never could have predicted it would have taken off in the way that it has. How many times has it been licensed? I’m not sure. I hope it hasn’t been obnoxious because I know I get turned off to songs when I hear them too much. Why is the band so popular? I don’t know. Nate has a powerful voice and he’s very charismatic and charming. His lyrics are both universal and specific. I hope people appreciate the depth of harmony instrumentation that we bring to the table even though I know that might not be the case. I can’t explain it because with the first album, that has songs that I expected would have caught on in a similar way. It’s the right songs at the right time. It’s coincidences and timing. The Chevy commercial for the Super Bowl was huge. A lot of dominos fell and put us on people’s minds at the right time. We’re thrilled. Talk about the Grammy wins. The “Song of the Year” win is great. But does the “Best New Artist “ win irk you a bit?We know how it works. Like Bon Iver winning it too. That means “best new artist on this scale” or in a mainstream sense. We’ve been doing this for the better part of our lives. We understand that. We’re thrilled. The band is regularly praised for its pop sensibilities. Talk about where those sensibilities come from. The biggest touchstone for all of us is the Beatles. Our initial practices were covering Beatles songs. We can play the back half of Abbey Road. We just love the Beatles. That’s how we learned to write songs and put chords together. Listening to “Penny Lane,” it has such a sophisticated structure. It sounds so seamless but it’s difficult to play. We grew up with that and trying to figure out those songs. I love the Beach Boys and that was a huge thing for me because of those harmonies. I just couldn’t understand why it sounded so rich and they were adding these notes in that I wasn’t aware of. That’s what pop used to be. We grew up in the ‘90s with Smashing Pumpkins and Nirvana and Oasis and Pearl Jam. We grew up on that which is pretty brilliant in a lot of ways. We were lucky. We grew up in the ‘90s with Smashing Pumpkins and Nirvana and Oasis and Pearl Jam. We grew up on that which is pretty brilliant in a lot of ways. We were lucky. Some Nights is two years old now but its popularity hasn’t waned. Are you anxious to release new music? We’ve started talking and sharing musical snippets and getting in the room and going through some ideas. Nothing too thorough but we have tons of ideas. One the . tour winds up in October, we’ll build the songs in a song that makes them a “.fun” song. That’s when they started sounding. Once we get serious, it’ll happen. Right now it’s just lots of ideas and different ideas and lyrics written on napkins.